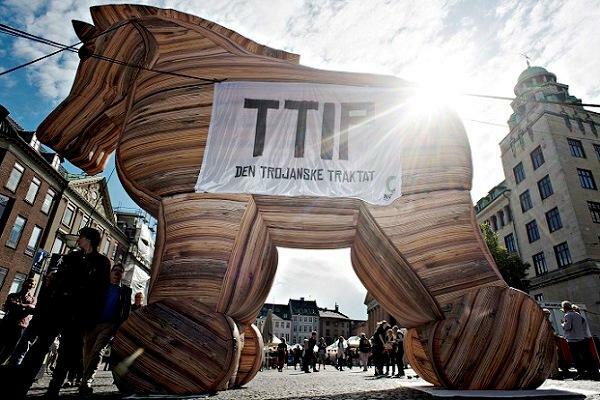 The proposed Trans-Atlantic Trade and Investment Partnership (TTIP) is meeting increased resistance in Eastern Europe. The European Citizens’ Initiative (ECI) “STOP TTIP!” is having some success with activating people living in this region of the EU to prevent the approval of this invasive free trade agreement. Some highlights of citizen actions taken in Romania, Hungary, Poland and Bulgaria shed light on this momentum. Nine associations and NGO’s have recently established a STOP TTIP alliance in Romania. Lavinia Andrei, one of the seven ECI committee members, helped build this national partnership. This is important because she is the only Eastern European voice on the committee. The alliance has created a website in Romanian to get the public involved in this campaign. Ten organizations in the country have decided to sign in support of the ECI including Eco Ruralis and InfOMG all of whom have noted that the TTIP is a bad deal for Romania. On October 11th, 8 cities in Romania had public events that demanded a stop to fracking and TTIP negotiations. These events were a part of the Global Frackdown and European Day of Action. In addition to this, the Romanian diaspora organized similar events in 4 cities in Western Europe. Hundreds of people protested, lobbied government officials and held public forums. So far, 1587 people and 10 organizations have signed the ECI STOP TTIP petition in Romania. This Fall, anti-TTIP public events were held in 5 Hungarian cities in conjunction with Friends of the Earth Europe (FOEE). According to FOEE, “A trade deal between the EU and US is a dangerous ‘Trojan Horse’ that puts the profits of big business ahead of our society, health and environment. Friends of the Earth Europe is taking a giant Trojan Horse on tour around Europe to reveal these dangers.” Local Hungarian NGO’s set up and took part in these public actions to raise consciousness. The tour also made stops in several other countries including Lithuania and Estonia. So far, 1470 people and 16 organizations have signed the ECI STOP TTIP petition in Hungary. Kooperatywa Dobrze (Wellness Cooperative) and Instytut Globalnej Odpowiedzialności (Institute of Global Responsibility) have organized a series of public discussions that discuss the nutritional value of food and the dangers of the TTIP. These events also include lunches with healthy food. A couple of months ago, 32 Polish NGO’s issued a press release that addressed their strong concerns over the negative impact of this EU-US trade deal on Polish people. So far, 1884 people and 7 organizations have signed the ECI STOP TTIP petition in Poland. On October 11th, the Global Frackdown and European Day of Action, hundreds of Bulgarians in 8 cities protested against the TTIP. Vania Grigorova of Solidarna Bulgaria said during an event that the, “TTIP is in its essence a coup against democracy, by which corporations aim for ultimate power. If this agreement comes into effect it won’t matter anymore who we choose to govern us. The voice of the people will account for nothing! Politicians and parties will compete only for the position of lackey to global business.” Four NGO’s and three political parties (The Greens, Green Party, Bulgarian Left) organized the event. This is interesting because the civil society worked side by side with politicians who agreed with them on the dangerousness of the TTIP. So far, 2316 people and 3 organizations have signed the ECI STOP TTIP petition in Bulgaria. The TTIP has been negotiated behind closed doors and this shows a serious lack of transparency by the European Commission. There are just too many questions that are still unanswered regarding how this free trade agreement would affect the Common Agricultural Policy (CAP) and ultimately farmers and consumers. The anti-TTIP movement is doing a great job of collecting signatures, lobbying public officials, organizing events and gaining support from organizations across the EU in order to prevent this terrible mega trade deal from taking effect. Soon, the European Citizens’ Initiative “STOP TTIP” will enhance its efforts to engage more people by providing funding to Eastern European organizations with new innovative projects. This will help the region develop a stronger strategy to put pressure on the European Commission to say no to the TTIP. If you do not support the TTIP, please show your opposition by signing this petition.